When he was a child, his mother had quite a tough time taking him to music lessons. After all how many children want to skip afternoon playtime for music? Kazi Nawaz Ibne Mahtab seemed an unlikely promise as a future musician. Or so it seemed at that time. But two decades later, the same boy has secured his place as the next promising star in our music scene. The song 'Jago Ullash' has just been overwhelmingly loved by numerous listeners all over the country and Newaz has been selected as the latest Airtel Radio Foorti young star of the month. Bangladesh has given birth to numerous talented musicians and bands over the generations. In a country where passion for music runs high, Nawaz has became the latest singer to make his mark as the next upcoming talent. However, it was not in music but as a participant of the world cyber games that Nawaz first made his mark. He took part in the World Cyber Olympics held in Germany, 2008 and also in China, 2009. It was after the games in 2009 that Nawaz, influenced by the mysticism of Lalon, picked up a guitar and started his musical journey. At that time, he never imagined that any of his songs would be heard by so many. But the spirit of Lalon really did get a hold of him. And once Lalon's spirit really gets hold of someone, he or she is capable of musical feats beyond the wildest imagination, literally speaking that is! Lalon's music is famed for giving subliminal exposures to the reality that lies beyond the material plane. For Nawaz, Lalon opened up a whole new world of music, imagination and experiences. It was in the course of developing the song 'Jago Ullash' that Newaz was first introduced to Raef Al Hasan Rafa. Rafa was already an accomplished young musician who has been a part of the underground music scene since 2003. 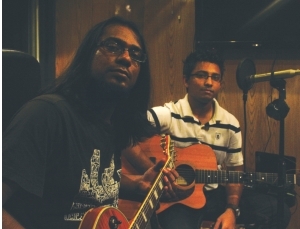 Rafa and Nawaz quickly struck a chord and worked extremely well together to record and produce the song 'Jago Ullash'. Rafa has become popular over the last few years as both a performer and producer. Having performed on many types of music genres, Rafa's role as the composer and producer was a huge factor in the final production of this song. Nawaz commented that Rafa's meticulous efforts gave that extra “feel” to the song that makes it special and loved by so many. It was only two years ago in 2009 that Nawaz first started playing music. Yet to the astonishment of many, including himself, his song was overwhelmingly voted by hundreds of thousands of radio listeners and he was picked as the 'Airtel Radio Foorti young STAR of the month' for the month of June. It is likely that Nawaz, the country's latest bright star in the world of music will go far and continue to entertain the music lovers of the country for years to come.